A basic premise: fans are deeply engaged with the media texts, characters, and teams they love, and creating content related to what they love is an extension of the pleasure of fandom. Or, to use Mel Stanfill's term, they are engaged in "loverbor", the labor of fan love. Another basic premise: the media industry benefits tremendously from the works that fans create. 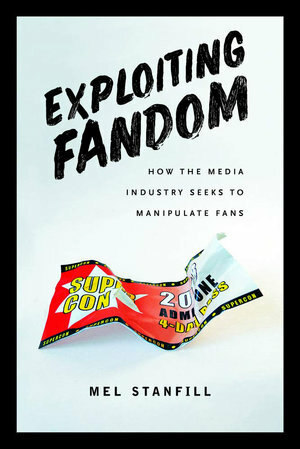 Stanfill's Exploiting Fandom lays out the framework for media's manipulation of fans and considers the consequences of these complex relationships of production and consumption. Fandom remains complex and contested. Where fans of speculative media have long been derided and ridiculed, fans of professional sports are celebrated and normalized, although the practices of both kinds of fans are not terribly different. The Tom Brady fan in line at the grocery store in his New England Patriots jersey won't get a second glance, but the Star Trek fan just this side of cosplay may get some giggles. Nonetheless, Stanfill offers extensive examples of how fandom is increasingly normalized and how, consequently, media companies began to include fans in their planning and marketing. Thanks to the internet, fans can repost existing content, produce and remix content, and participate in conversations that expand the market for a media text. As Stanfill notes, "audience desire to participate has gone from seen as something atypical (sometimes aberrant) that periodically happened to media to something interpreted as endemic and therefore something to manage and make productive." Stanfill outlines the ideal, or idealized, fan as a straight, white man, and goes on to explain the many ways in which fans who are outside of that norm are seen as less desirable audiences. There are many white male fans, particularly in fictional representations, whose fandom represents a failed masculinity, yet there's often a redemption narrative that enables a proper balance between enthusiastic (yet subdued) fandom and heteronormative masculinity. One of Stanfill's examples focuses on an episode of CBS's The Big Bang Theory from an early season in which Penny is inconvenienced by a movie prop that Leonard and Sheldon have placed in the hall. When Leonard decides to sell his fan collectibles and "grow up", his decision warrants a compliment and kiss on the cheek from Penny, assuring him that less fandom equals more masculinity. Women are marginalized as fans of both sports and speculative media: regarding sports, many die-hard male fans believe that women are incapable of being authentic fans of men's sports simply because they're not men. Even in subtle ways, women as sports fans are deemed less-than because their means of performing fandom are different. Similarly, women who engage in writing fan fiction or vidding (creating new video texts by arranging television or film clips and setting them to music), acts of fandom that are categorized as feminized practices, are minimized simply by engaging in these activities. As Stanfill wryly notes: "Things fangirls do are not real fans things, even if fanboys also do them." In rethinking the practices of fandom, Stanfill considers consumption, beginning with Jonathan Gray's idea of the paratext, all of the media products and practices related to the object of fandom that are not the object itself. The intermingling of consumption and production in fandom studies inevitably complicates a definitive idea of what it is that fans "do". If, as Stanfill argues, consumption is feminized and production is masculinized, how can we piece out those practices when they overlap without also regarding the binary manner that the media industry uses, sometimes tacitly and sometimes explicitly, to understand their target audiences? Consumption 1.0, the most straightforward expression of fandom, is the assumption that basic consumption of the media product is necessary to fandom. That might seem self-evident, yet the intersections of factors including gender, race, and socioeconomic status make it difficult for some fans to consume media in environments that privilege white, heteronormative men. In the chapter "The Long Arm of (Beliefs About) the Law", Stanfill addresses the issues of intellectual property, terms of service, and copyright with regard to fandom. Reuse and remix, whether through providing commentary or creating something that is an homage to and an extension of the media text, are subject to sticky legal and ethical issues. Stanfill shows that terms of service often include language that far exceeds the actual legal rights of corporations that own media texts. What weighs in the balance, and also has impact on fan communities, is the degree to which intellectual property holders allow fans to use images, clips, and characters in their own creations. Then, who has intellectual property rights to the new media text? PotterWar is an excellent example of the battles over intellectual property. When Warner Bros., which owns intellectual property rights to much of the Harry Potter universe, decided to enforce those rights, the corporation sent threatening letters to unauthorized users, many of whom were children. In response to the terror unnecessarily inflicted on young fans who feared they were going to prison, fans launched a global boycott of Warner's Potter-related products. The corporation backed down, but not without an enormous blemish. Stanfill argues that fans create products out of joy and love, not to compromise the core text, and seldom profit from their creations. Exploiting Fandom brings together mainstream sports fandoms and speculative media fandoms, often finding strong correlations between the two. A strong example is thinking of fantasy sports as a paratext because fans take existing texts -- namely, athletes -- and remix them to create new narratives of their own making when constructing fantasy teams. The project of comparing and interlacing these fandoms is a significant topic for further study, especially as readers and fans begin to think more critically about the ways that the media industries exploit their fandoms, with or without their consent.